And, yes, most of it is fun! 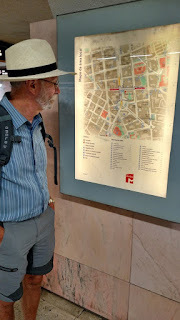 I recently posted on Lisbon’s excellent metro system – reflections from a recent visit – but also want to comment on some of the other elements of a varied and robust public transportation system. Like San Francisco’s cable cars, this electrified streetcar line is part transportation system and part tourist attraction. 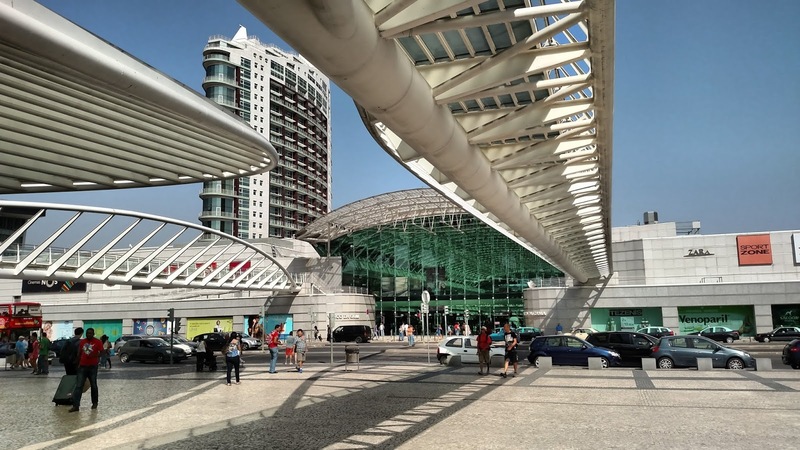 It is regularly listed as one of the top 10 things to see in Lisbon. 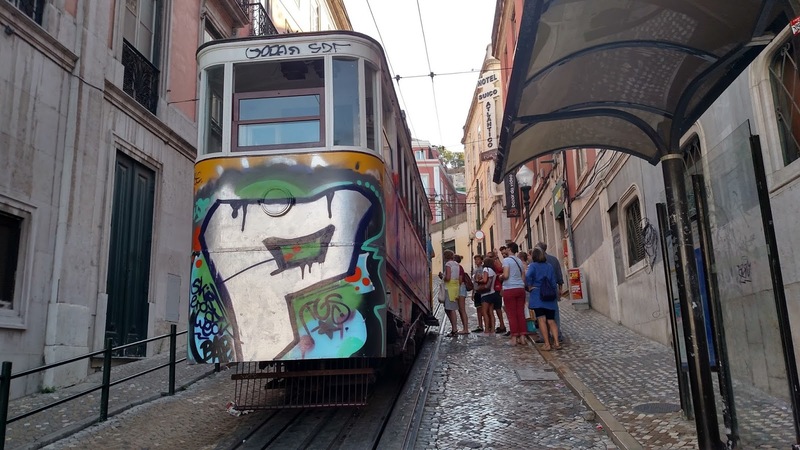 The crowded, rickety tram pursues a colorful route through the city, highlighted by a precipitous, winding ride through the narrow lanes of the historic Alfama district. There is often a queue to get on the Number 28, but it’s worth the wait. 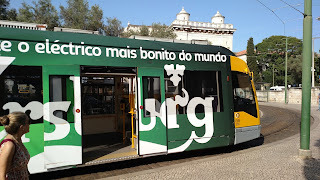 Alongside the “antique” trams plying Line 28 and a couple of other routes, Lisbon also uses modern, comfortable trams, notably on Line 15, which efficiently connects the city center with the outlying tourist destination of Belem. All the buses I saw looked clean and modern. 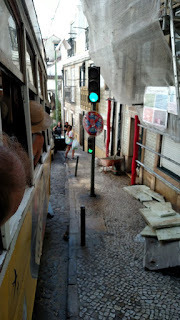 The transit authority uses minibuses to navigate the narrow streets of the Alfama district. 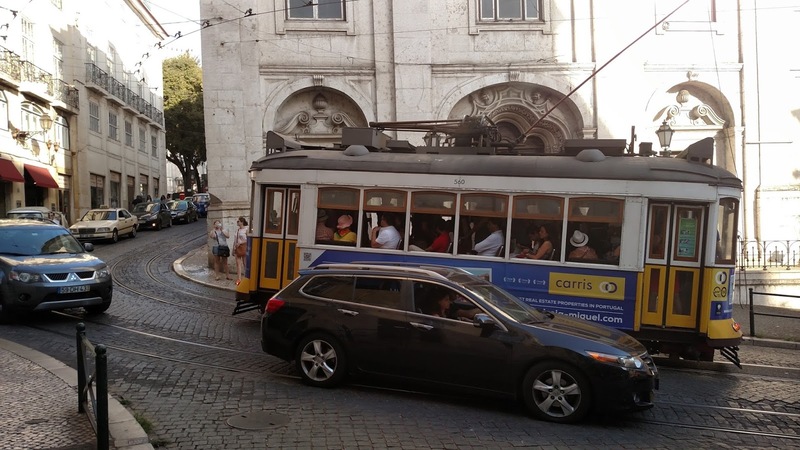 Perhaps nothing speaks to the tourist boom in Lisbon more than the proliferation of tuk-tuks – 3-wheelers that race up and down the streets, serving as taxis and tourmobiles. These appear to be loosely regulated and entrepreneurial, offering travelers a quick and sometimes harrowing ride through the city. They vary widely in size and motive power, so it’s hard to say whether these are a net positive or negative for air quality and greenhouse gas emissions. But they are fun! 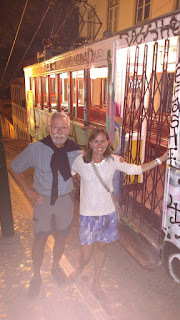 Lisbon is a very hilly city, and funiculars are practical as well as being fun. Although I don’t like the acceptance of graffiti on the cars, they offer a very picturesque trip! 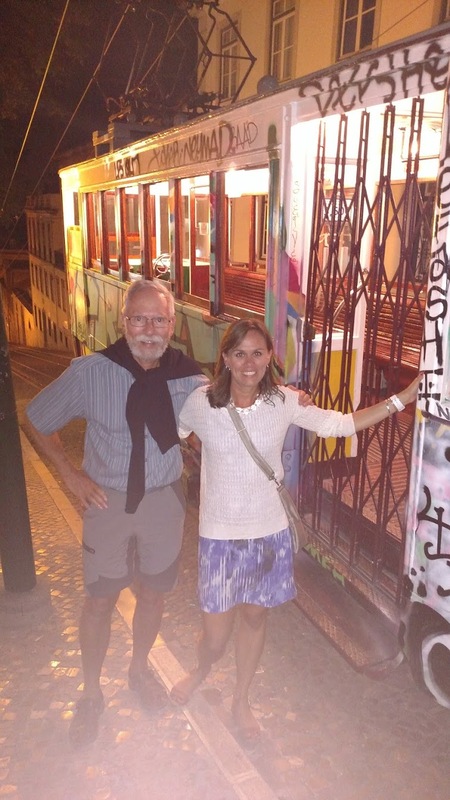 Although generally grouped with the funiculars, the Elevador Santa Justa really is what it says – an elevator! 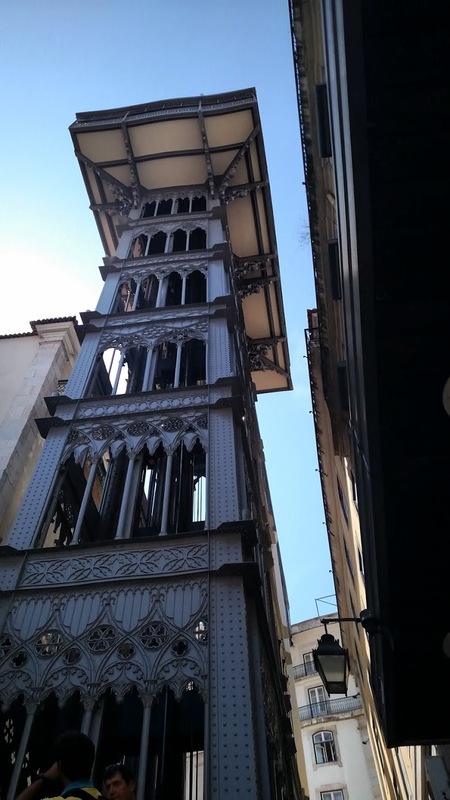 Designed by a student of Gustav Eiffel, the iron structure carries passengers from the lower town to the upper town – with lots of selfies at the top! 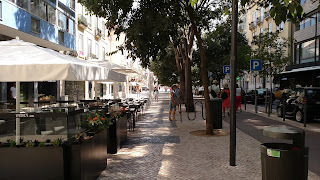 Although the streets are all thronged with people, Lisbon is in many ways not an easy city for pedestrians. For one thing, cars (not to mention trams) roar (or rumble) through the narrow streets with pedestrians often walking single file and hugging the walls of the bordering buildings. For another, the beautiful and characteristic pavement tiles (calçada portuguesa – you saw them in Rio during the Olympics) are tough to walk on. As for bikes, I saw very few, whether due to a non-bicycling culture or the challenging terrain. In the newer parts of town, where there are broad boulevards, the city has embarked on a program of reducing auto space and expanding room for bike lanes, pedestrian space, and the always-important sidewalk cafes. There isn’t much TOD in Lisbon – at least that I saw – with the notable exception of the Parque das Nações complex in the north of the city. Originally built for the 1998 World Exhibition, the complex houses an aquarium, a concert hall, a shopping mall, and other attractions, together with housing. The complex is served by a multimodal transit station, designed by Santiago Calatrava, which links the Metro, national and commuter rail, and buses. Although the design and architecture is a bit too concretey and windy for my taste, it is impressive and worth a visit. All-in-all, Lisbon is an easy and inexpensive city to get around in using public transportation – at least in the center – and a wonderful place to visit. Está bem! 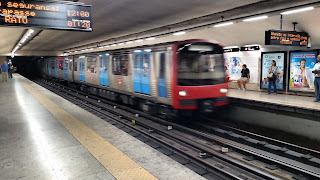 Lisbon Metro – Nice ride! I had occasion to spend a few days in Lisbon recently and of course did several rides on the Metro. 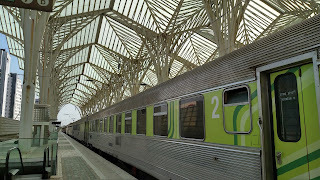 The system is well laid out, with four lines criss-crossing one another in a dense network in the city center. Trains are clean and frequent. Stations are clean with clear signage and are decorated with bright, tasteful station art – traditional Portuguese tiles with updated images. Every major tourist and business destination in the center is served with the exception of some in very hilly neighborhoods, which need special treatment. 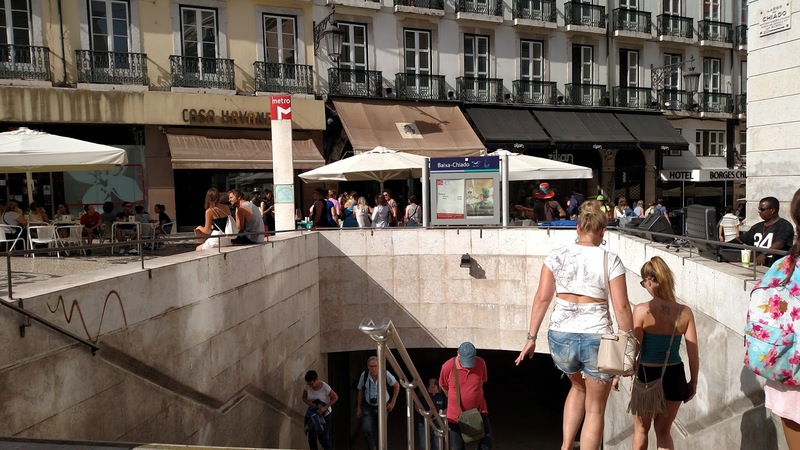 (One clever solution is found at the Baixa-Chiado station. The station’s platforms are in the lower town – Baixa – but there is a long escalator link to the Chiado district in the upper town. 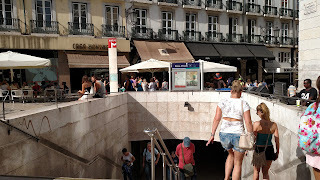 Photo of the Chiado entrance below). There are direct connections to commuter rail and ferry terminals. Maps and line charts are clear and easy to understand. What demerits can be given? Not many. Some of the underground transfers are long, but that’s a feature of most large networks. Occasionally three-car trains (as opposed to the normal 8 or 10) appear, with little warning, stop at the top end of the platform, and zoom off as customers are still running down the platform to catch it. But overall an excellent system! 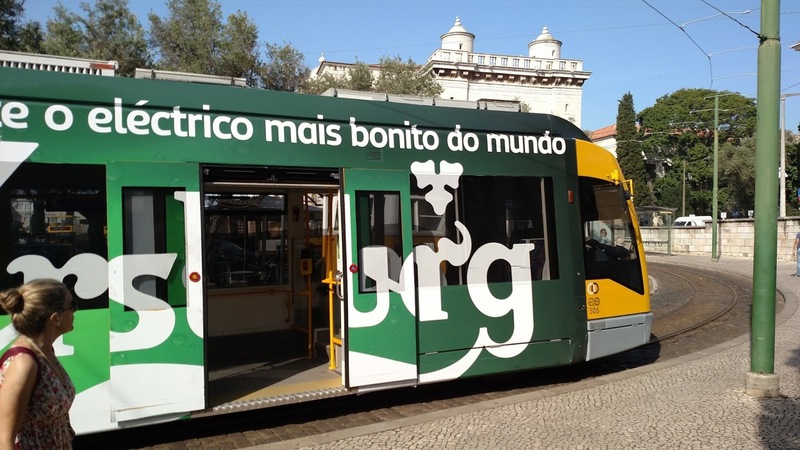 More on the other aspects of Lisbon transit (trams, buses, funiculars, tuk-tuks, etc.) in another post.